For long-term survival of cancer, treatments that target multiple cancer vulnerabilities and adapt to changes within the tumor may be required. Activating the patients own immune system is an important part of such approach. The immune system is a powerful, flexible, and adaptive component for generating long-term remissions. However, chances of successful treatment may increase further if other aspects of cancer progression, like cancer stem cells, metastatic behaviour and reduced tumor cell apoptosis are be targeted simultaneously. Blocking AhR holds the promise of a non-toxic therapy that targets multiple crucial tumor progressing processes at the same time. Therefor we believe that our AhR inhibitors will play an important role in Immuno Oncology drug combination approaches. The aryl hydrocarbon receptor (AhR) is normally present in epithelial cells where it can be activated by various ligands and is generally involved in suppressing inflammation. In many solid tumors however, AhR is over-expressed and hijacked to act as a key driver of tumor progression and a powerful inhibitor of tumor-specific immune responses. 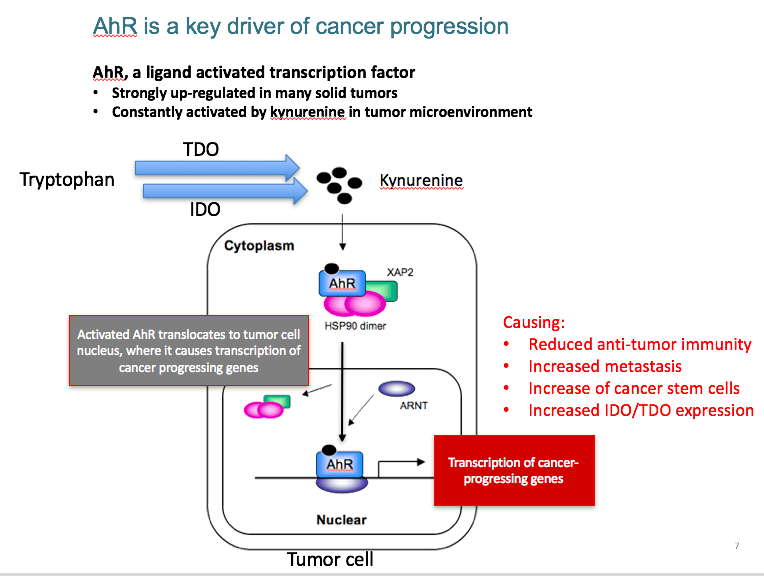 In the tumor microenvironment AhR is activated by kynurenine, which is produced via IDO and TDO. The expression of these enzymes is upregulated by AhR activation, creating a detrimental positive feedback loop causing the constant activation of AhR. If activated in a cancer or immune cell, AhR translocates to the cell nucleus, where it causes the transcription of genes that are important to cancer progression via many pathways. Apart from reducing the responses of the immune system to cancer, AhR activation causes tumor cells to migrate, invade local tissue and metastasize to distant organs. The AhR also plays a role in producing “cancer stem cells”, a type of tumor cell that is highly resistant to chemotherapies and is thought to be responsible for lethal relapse and metastasis even years after “successful” chemo- or radiotherapy. Many immune cells express AhR. Examples are macrophages, dendritic cells and T cells. 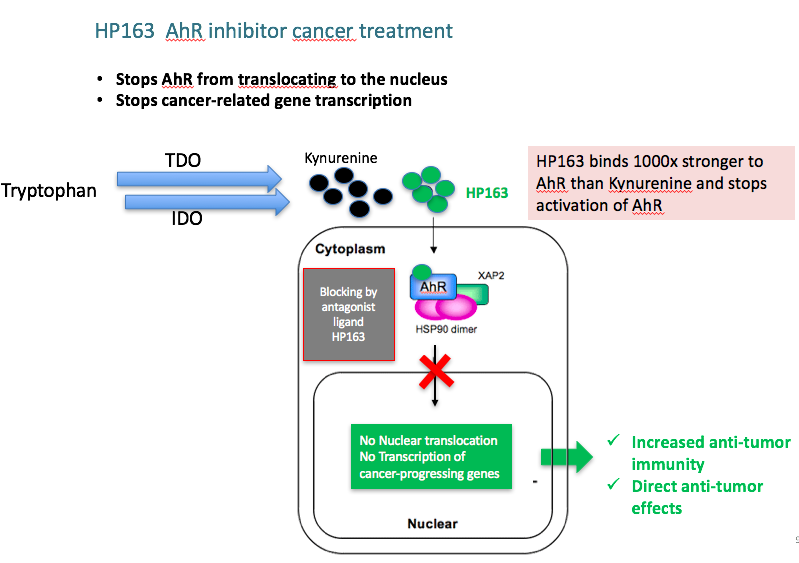 Activation of AhR in immune cells, as a result of increased levels of kynurenine in the tumor microenvironment, causes reduced anti-tumor immunity via sebveral mechanisms. Hercules has developed HP163, a small molecule inhibitor of the AhR. By blocking AhR, Hercules' inhibitors not only boost anti-tumor immunity, they also suppress metastasis and the formation of chemo-resistant cancer stem cells. As such, HP163 has the potential to attack multiple vulnerabilities in the cancer microenvironment at the same time. Hercules aims to develop AhR inhibitors which have strong single agent efficacy in cancer patients and which wil be a key component of Immuno Oncology drug combination regimens.